What Does It Take to Be a Good Family Caregiver? Providing high-quality care may seem like an easy job, but the daily challenges can make the role overwhelming and difficult to master. However, it’s important for caregivers to give their all to strengthen their senior loved one’s health and maintain a positive atmosphere inside the home. Here are some of the ways people caring for an elderly loved one can tell if they’re a good caregiver. As a family caregiver, you’ll need to balance your personal and professional commitments with your caregiving duties. 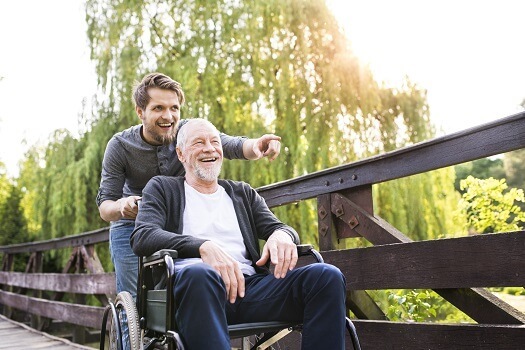 If you’ve learned how to utilize assistance from others, as well as local resources, these are signs of being a good caregiver. Being organized and good with time management allows you to complete tasks in a timely manner without compromising your parent’s safety and overall health. You don’t have to be a medical genius to be a family caregiver, but a little research could go a long way toward boosting your loved one’s mental, physical, and emotional health. Good caregivers are motivated and knowledgeable when it pertains to their loved one’s current health conditions. A good family caregiver will take the time to learn more about the disease their loved one is living with and do everything possible to alleviate the symptoms associated with that condition. If your elderly loved one is living with a serious medical condition and needs help managing the tasks of daily living, reach out to Home Care Assistance, a Rhode Island elderly care agency you can trust. Our caregivers are available 24/7, there are no hidden fees in our contracts, and we offer a 100% satisfaction guarantee on all of our in-home care services. Keeping your loved one physically and socially active can stave off many age-related conditions and enhance his or her quality of life. Encourage your loved one to exercise on a regular basis, and take him or her to community functions to prevent isolation. If you keep your loved one active, you’re boosting his or her overall health and lowering the risk of depression. A good family caregiver will find a variety of activities to do inside and outside of the home. Part of being a good caregiver is preparing healthy meals for your loved one. The social nature of mealtimes should be important to you. Good caregivers go out of their way to make sure their loved ones have a comfortable eating space and healthy meal choices. Many seniors have difficulty eating and drinking as they age due to cognitive decline, swallowing disorders, and other health conditions. However, good caregivers alter meals according to their loved one’s individual needs. The relationship between you and your parent is often a reflection of your caregiving strategy. If your loved one is always tense or afraid to speak up, this could be due to the negative emotions you display each day. When family caregivers are polite, loving, and open-minded, their loved ones may mimic this behavior and maintain a positive attitude. A good living environment could strengthen your loved one’s cognitive abilities and boost his or her self-esteem. Family caregivers need to care for their own wellbeing. If you are caring for an aging loved one and are feeling overwhelmed, consider hiring a professional caregiver to provide respite care. Rhode Island families who want to avoid burnout can turn to Home Care Assistance. One of our professional caregivers can assist your loved one at home while you take a nap, go to work, run errands, or go on vacation. To schedule a free in-home consultation, call (401) 284-0979 today.